rebecca likes nails: braided/fishtail nail tutorial! I doubt it's coming back. So every Monday and Tuesday I won't be able to read blogs all day to keep me company. Boo hoo. As you may have read in a previous post, I am trying my best to do everything you guys request in the comments of my giveaway. So here is something that was requested! Petra left me a lovely message and asked if I could do a tutorial on the middle finger of these crazy skittle nails, and a bunch of you asked for more tutorials in general. It looks like a braid! But it's just stripes! I really like this look. I might do a full set of nails with these colors. Haha. After the first 2 stripes, you just keep adding stripes alongside the previous ones, and it all comes together. It looks funny at first, and it can be confusing, but just keep going! You can make the stripes as thin or as thick as you like. You could use tape to make it extra neat, but it would take a long time because there are so many stripes that would need to dry before adding the next one. 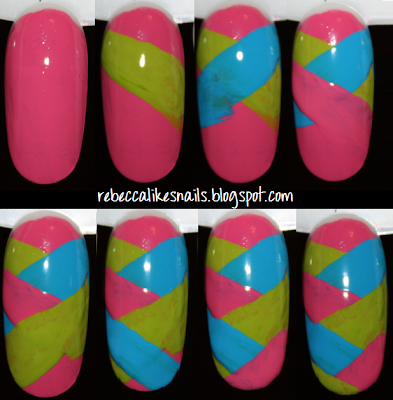 This design works best when you use really opaque colors, so that you don't have to do multiple coats of each stripe. Good luck Petra, and to whoever else wants to try this out! If you do try, post a link here! I'd love to see it. And maybe you'll find someone.. Like a freind od a friend or a fellow blogger or someone who's just a huge Blink 182 fan who would go with you? I really hope you can go to the concert and enjoy it. I'll keep my fingers crossed for you! I'm with Sandra... I hope you'll manage to find someone to go with you to the concert. Good luck!!! I wanted to comment on this post from the second I saw it...and now I can! :) I LOVE this design and love that you showed us how to do it! Very pretty! I am going to try this later tonight!! I love this!!!! Thanks for the tutorial! 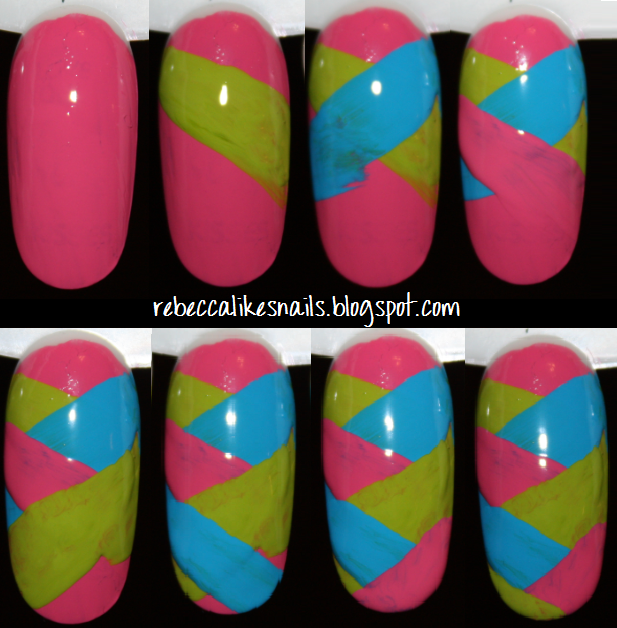 This was linked to from Adventures in Acetone... what a great idea! =D Thanks for sharing! I loved your blog, and I'm following here ... kisses and a great weekend! i did these with sally hansen insta dri in rose rush, blue blast and lickety split lime and they look exactly the same! I'm also a new follower because this blog looks super cool. My nails didn't turn out nearly as nice as yours did.